Wedding Traditions: Observe or Forego? Wedding traditions are cherished because they pay homage to history and culture. 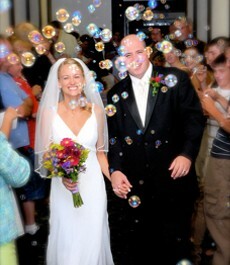 However, identifying and following dozens of wedding traditions can be very overwhelming for modern brides. Some may even feel that wedding traditions infringe on their personality, beliefs, or idea of what a perfect wedding day should be. If you’re having a difficult time keeping them all straight, we’ve compiled a list of the most popular American wedding traditions. Our experienced wedding planners also offer some insight into which traditions modern brides are keeping, and which they’re choosing to forego. Which wedding traditions will you incorporate into your special day? All traditions related to who pays for various items related to a wedding have changed pretty dramatically over the last few years. There is a definite trend toward people waiting until they are in their late 20’s, early 30’s and even late 30’s to get married. In most cases, the couples are both paying for the entire wedding on their own or they are paying for part of it and other family members are helping where they are able. Most couples these days work together on both the purchase of the engagement ring and the planning of the honeymoon. If a couple decides they are going to have an engagement ring (this tradition is also changing), typically they will choose it together or the groom will get very specific details about what the bride is envisioning. A ring is a lifetime purchase and one that you both want to be happy with. Many couples have lived on their own for several years, have furnished apartments or homes and do not need the traditional towels, sheets, etc. that might make up a wedding registry. Gift registries today may include everything from decorative items for the home to experiences for the couple. When you take into account the life the couple is currently living, the wedding registry will start to make sense to you. Throwing rice as the wedding couple finishes the ceremony has been out of favor for quite some time because of the harm it can cause to birds. Bubbles, lavender, fall leaves or rose petals all work well. 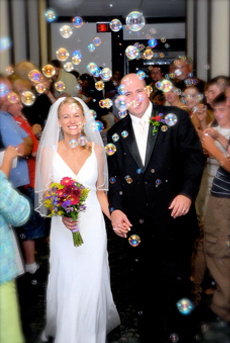 If it’s a beach wedding, consider beach balls! Something old to tie the bride to her family and past; something new to represent being part of a new family; something borrowed from a happily married woman wishing the bride the same success; something blue representing faithfulness, loyalty and purity. Consider a charm bracelet, necklace or pin to incorporate all these items. Technically, today’s gowns aren’t white but candlelight, warm ivory, ecru or frost. And, many brides are opting out of white and choosing colors like pink, champagne and even black. Whatever the bride feels beautiful in is the perfect choice. Most couples no longer follow this tradition but instead plan a “first look” for the photo session before the ceremony. Capturing the groom’s first look at his bride has resulted in some wonderful photos. This practice also means that most of the photos can be taken care of prior to the wedding ceremony, freeing up more time to spend with guests. The choice of who will walk a bride down the aisle is the choice of the bride and can range from the father, to a step-father, mother, brother or even best friend. Whether the words “who give this bride” are incorporated into wedding ceremony is also very much a personal choice. A traditional wedding cake is almost an anomaly these days. Everything from cupcake towers and candy stations to individual cakes for each table seem to have replaced the traditional layered wedding cake. Whether you are a couple looking to incorporate all the traditional touches in your wedding or a couple with your own ideas as to what is important to be included, the wonderful thing about weddings today is that you are free to create the experience that means the most to you. To consult with an experienced wedding planner from Cragun’s Resort, please fill out our wedding inquiry form!